Treatment and prevention of flea and tick infections (Ctenocephalides felis) for 7 to 8 months. 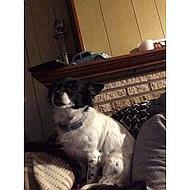 The activity against fleas starts immediately after the collar is applied. Protects against development of flea larvae in the immediate vicinity of the animal for 10 weeks. 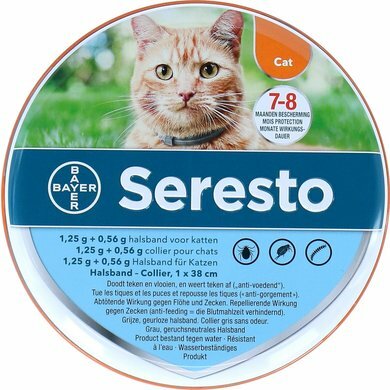 Seresto can be used as part of a treatment strategy against Flea Allergy Dermatitis (VAD). The product has persistent acaricide (killing) efficacy (Ixodes ricinus, Rhipicephalus turanicus) and repellent (anti-nutritive) dysfunction (Ixodes ricinus) for 8 months. It works against larvae, nymphs and adult signs. 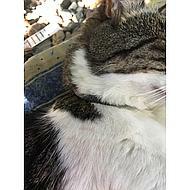 It is possible that the sign that was already present on the cat before treatment, will not be killed within 48 hours after the collar is attached and attached and visible. Therefore, it is recommended to remove the sign that is already on the cat at the time of application. The prevention of infections with new sign starts within the two days after the collar is applied. very nice tires. no more worrying about the whole year. not cheap to buy, but I will pay for it. A new world opens with Seresto. No more hassle with drops with a pipette. A very user-friendly tool! Nice tire that you can adjust yourself. Does its job well and is affordable! I buy super product every year and I am very satisfied. Question: Does the collar open when the cat gets stuck somewhere? Answer: Yes, the collar has a breaking point. Question: I have a 10-week kitten with fleas. We have tried all remedies, medicines and cures but nothing helps. Can I buy this belt for her? And does this band remove its current fleas? 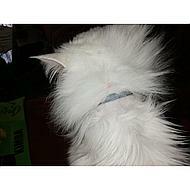 Answer: This collar should not be used in Kittens younger than 10 weeks, from 10 weeks onwards the collar can be used. It is possible that ticks that were already present on the cat before treatment can not be killed within 48 hours after applying the collar and remain attached and visible. 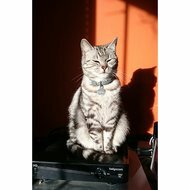 Therefore, it is recommended to remove ticks that are already on the cat at the time of application. The prevention of infections with new ticks starts within two days after the application of the collar. Answer: The manufacturer recommends: Do not use in young cats less than 10 weeks old. 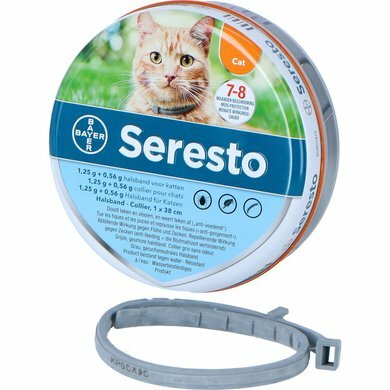 Question: if the cat refuses 10 kg, which Seresto collar? Answer: If your cat weighs more than 8kg, you can still use the collar because the dog collars have another ingredient that is unsuitable for cats. 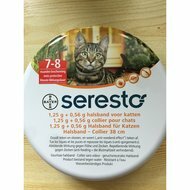 Question: What can happen if the cat with the Seresto collar is lying on the bed? Answer: According to the supplier, there is no danger to humans, but direct contact with the collar should be avoided. After touching a thorough washing of the hands is recommended. Question: Is the collar dangerous for pregnant women? Answer: According to the supplier, pregnant women are not at risk for the unborn child. However, after touching the collar, you should thoroughly clean your hands. Question: My cats are free-range. If they get stuck with the collar, will it break loose? Does it have a breaking point or the like? Answer: Yes, there are two safety catches on the collar, which release themselves under medium force. Answer: That's certainly possible. The collar can be made suitable. Follow the instructions in the package leaflet how to properly trim the collar to the correct length. Question: is this also suitable for kittens? Answer: Yes, the product has a best-before date. Currently, all collars wear Mhd 09/2020. You can keep the product for a while. Question: Can a nursing cat wear this band? Answer: The safety of the veterinary medicinal product has not been demonstrated in target animals during gestation or lactation and as no data are available, the use of the product is not recommended in pregnant or lactating cats. Question: From what age can my cat wear this collar? Answer: Kittens from 10 weeks of age may wear this collar. 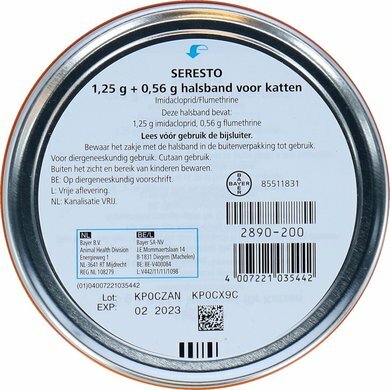 Do not use in kittens under 10 weeks of age or animals that are hypersensitive to the active ingredients or to any of the excipients. 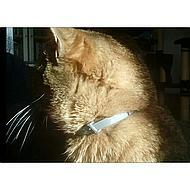 Answer: When wearing a collar or flea collar, the chance of the cat sticking somewhere is always present. Fortunately, this has been taken into account in the development of the Seresto belt. With a certain force on the belt it breaks or shoots the clip loose so minimizing the chance that the cat lingers somewhere.